There have been lots of stories in the British press recently related to immigration, and these have made it clear that a sentiment still exists that is opposed to the familiar xenophobia with which the topic is usually discussed in the UK. For a moment it has seemed that perhaps not everyone around us is okay with the detention, deportation and ultimate killing of people on the grounds that they are not from here, were born somewhere else, or have a different skin colour and are deemed ‘undesirable’ because of it. However a liberal anti-racism that seeks small changes in immigration policy – a fine-tuning of just how it is we execute the barring of entry to and forced removal from this country – does nothing to end the violence of that system, but is rather a position that chooses to participate in it with a sense of moral acquittal. 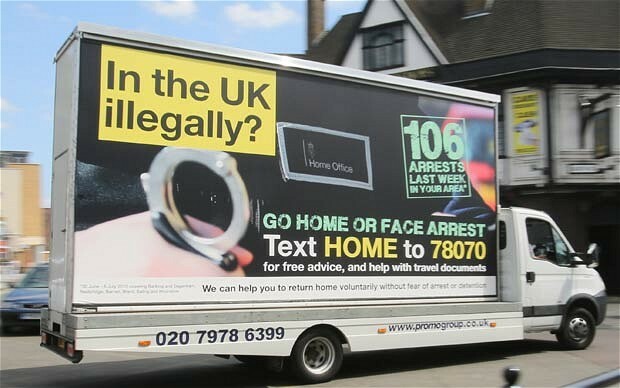 This sort of response to stories like the Home Office’s racist van – driven around parts of London with a message to the black population that read ‘In the UK illegally? Go home or face arrest’ – and the attention drawn to the routine harassment of that same population by the UK Border Agency’s immigration officers often comes in a form that appeals to ‘diversity’ as the ideal to be upheld, instead of the enforcement of legislation regarding lawful status to remain in the UK. Yet if we are to properly bring to an end the situation where a person can be deemed to be illegal, we must abandon the notion of diversity, that is itself racist. Choose to defend the presence of ‘illegals’ not because they’re just nice to have around, but because you appreciate that the suffering borders inflict is intolerable. No one is illegal, full stop. It is a good moment to be reminded of the race and class based analyses of post-war British immigration policy by writers such as Ambalavaner Sivanandan, who describe the state’s changing tolerance towards different groups of foreign labourers as linked importantly with economic interests. The argument that immigration legislation since the Nationality Act of 1948 – which gave British citizenship to the citizens of the colonies – has been aimed at achieving control over the import of labour from the (ex-)colonies is a convincing one. How Black people came to be policed – as those who slip most easily into being judged ‘illegal’ – when they did move to the United Kingdom and, later, during the sixties and seventies crisis, when ideas changed regarding how much Black labour was necessary, has also been analysed in the work of writers such as Sivanandan, Stuart Hall and Paul Gilroy. Whilst we have witnessed an intervening history that led to a remoulding of the earlier immigration acts, the discussions and observations from these thinkers remains germane given that the form of oppression has changed little. In order to keep up with what is deemed acceptable regarding racism for the liberal state, as well as the changing role of government’s guardianship over the market, the relevant laws and policing have adapted. Yet in the run up to the 2015 general election we see the UK Labour party is still able to promise another immigration act to ‘put an end to workers having their wages undercut illegally by employers exploiting migrant labour.’ Even in the language of progressive anti-exploitation we can see clearly the effect Labour’s policy will have on those who would like to work here but are not allowed and how this is a continuation in the same spirit as all previous immigration bills. Invariably it is concerned with the maintenance of a profitable economy. One change is clear however: whilst previously the language of race relations was used as a justifier, that ideology is now stripped away and the fact that economic dramatis personae are the main concern — rather than humans, and especially Black humans — is plain to see. Understanding immigration controls as policing allows us to make sense of, and is perhaps most vividly noticeable in, the most brutal and traumatising examples of its enforcement. Sivanandan notes in ‘From immigration control to “induced repatriation”’ (1978) that in the 1970s the House of Commons (all party) Select Committee on Race Relations and Immigration recommended ‘”the police, the Immigrants Service Intelligence Unit and other authorities” should be given powers to seek out illegal immigrants and overstayers’. In July 1993 40-year-old Joy Gardner was killed by police at home in front of her children because she had overstayed her visa. Police had restrained her with a body-belt and 13ft of tape around her head in order to force her removal from the UK, resulting in a coma and her eventual death. Last Saturday the friends and family of Joy Gardner came together for the anniversary of her death to call for justice alongside the friends and family of another victim of police killing, Mark Duggan. The killing of Duggan in Tottenham in 2011 highlighted that police violence in the enforcement of immigration law is a continuation of the brutality they inflict on the day-to-day lives of Black people. Today immigration removals are undertaken by UK Border Agency (UKBA), an outfit that is hard to distinguish from the police. During their ‘spot checks’ and searches for ‘immigration offenders’ they wear similar uniforms and carry much of the same equipment that police do. Yet, despite repeated findings of ‘institutional racism’ and their clear structural role in policing Black communities, the constabulary has found it easy to reject allegations of entrenched racism. It isn’t as easy for their partners-in-policing at the UKBA to hide behind such claims as they target Black people throughout the country each day. The findings of the inquest into the death of Jimmy Mubenga have made it even harder for the immigration industry to feign respectable non-racism. Last month an inquest jury found that Jimmy, a father of five ordered to leave his family and return to Angola following a prison sentence for his involvement in a nightclub scuffle, was ‘unlawfully killed’ by the guards escorting him on his deportation flight. After prolonged restraint the three guards had suffocated him to death as they tried to muffle his cries for help from passengers and staff on the British Airways flight. Through the inquest it came to light that some of the G4S Deportation Custody Officers contracted to remove Jimmy from his home and family, those that became his killers, had racist text messages saved on their phone. Evidence was heard that the texts were shared widely amongst UKBA staff and their hired police from G4S. The racist texts are thoroughly unsurprising given the conditions of immigration laws that come to judge Black people as less than human and the policing violence that subsequently comes to confirm that they are indeed less than human. Jimmy was to be removed as he had committed a crime for which he had served time in prison, allowing the Secretary of State to classify him as no longer ‘desirable’ in the UK. A similar fate currently awaits Trenton Oldfied who was imprisoned for ‘public nuisance’ after an aquatic protest during the Oxford v. Cambridge boat race in 2012. He committed a crime that in the eyes of Theresa May marks him out as a threat to public order, again allowing her to deem him ‘undesirable’ and to muster the state’s capacity to police public order to send him ‘home’ – away from his partner and new-born baby in London. Trenton is white and will likely face a qualitatively different violence than his Black counterparts, but the ‘go home’ message resonates clearly. The racist van that has upset so many only serves to restate and clarify what we have known for decades – ‘if you want to live in peace, go home’. But this is all in the name of another ‘peace’, that of British order and capital’s continuing ability to exploit. That there has been a small awakening to the racism of immigration control so close to the second anniversary of the August 2011 riots is opportune. It allows thinking of immigration policing in the same continuum as the state violence that brought about that disorder. Our response to UKBA should thus take the same form: No Justice, No Peace. Originally posted at Africa is a country. Yet if we are to properly bring to an end the situation where a person can be deemed to be illegal, we must abandon the notion of diversity, that is itself racist.